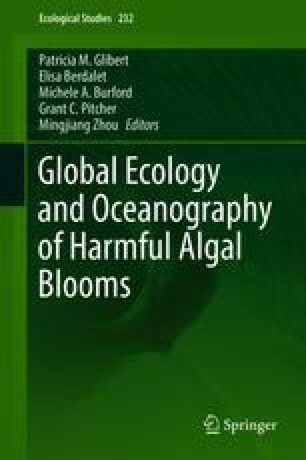 Of the many anthropogenic and climate-related changes occurring in marine biota reported in oceanic ecosystems worldwide, the recent advent of green Noctiluca scintillans (herein after Noctiluca) as the dominant bloom-forming organism represents the most dramatic and extreme. Widespread and intense blooms of Noctiluca have now become a common feature in the Arabian Sea and in many other tropical coastal ecosystems that come under the influence of the Indian monsoons. Noctiluca is a mixotroph, and even among this subset of marine organisms, it is considered exceptional because of its permanent, independent, free-swimming endosymbionts that are capable of photosynthesis. Since the endosymbionts are dependent on nutrients, Noctiluca competes with other phytoplankton, and since it feeds on other phytoplankton, it competes with many secondary producers for food. Because Noctiluca is not a preferred food for zooplankton, its emergence at the base of the food chain represents a threat to many countries where coastal marine resources are of great economic and cultural significance. Here we have drawn on previously published information to establish the major ecological drivers of Noctiluca blooms. Although prior research has established a good foundation, more detailed studies are needed to establish the ecophysiological mechanisms that underpin Noctiluca’s ability to grow and persist as massive blooms for several months and at a time when conditions would be considered hostile for maintaining a classic marine phytoplankton community. This work is partially supported by grants NNX13AI29A and NNX17AG66G from the National Aeronautical and Space Agency, USA, and grants from the Gordon and Betty Moore Foundation and the Sultan Qaboos Cultural Center, USA, to J.I. Goes and H.do R. Gomes. Al-Hashimi is supported by Sultan Qaboos University and the Ministry of Agriculture and Fisheries Wealth, Sultanate of Oman, and A. Buranapratheprat is supported by the National Research Council of Thailand, Thailand, and the Japan International Cooperation Agency, Japan.